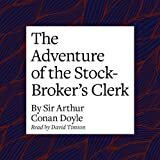 About the Book: "The Adventure of the Stockbroker's Clerk" is one of the 56 short Sherlock Holmes stories written by British author Sir Arthur Conan Doyle. It is the fourth of the twelve collected in The Memoirs of Sherlock Holmes in most British editions of the canon, and third of eleven in most American ones (owing to the omission of the "scandalous" "Adventure of the Cardboard Box"). The story was first published in Strand Magazine in March 1893 and featured seven illustrations by Sidney Paget. 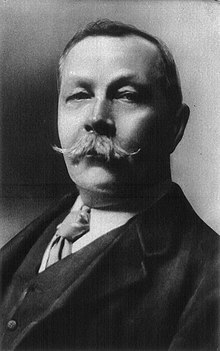 About the Author: Arthur Ignatius Conan Doyle was born on 22 May 1859 at 11 Picardy Place, Edinburgh, Scotland. From 1876 to 1881, he studied medicine at the University of Edinburgh, including a period working in the town of Aston (now a district of Birmingham) and in Sheffield, as well as in Shropshire at Ruyton-XI-Towns. While studying, Doyle began writing short stories. His earliest extant fiction, "The Haunted Grange of Goresthorpe", was unsuccessfully submitted to Blackwood's Magazine. His first published piece "The Mystery of Sasassa Valley", a story set in South Africa, was printed in Chambers's Edinburgh Journal on 6 September 1879. On 20 September 1879, he published his first non-fiction article, "Gelsemium as a Poison" in the British Medical Journal. In 1882 he joined former classmate George Turnavine Budd as his partner at a medical practice in Plymouth, but their relationship proved difficult, and Doyle soon left to set up an independent practice. Arriving in Portsmouth in June of that year with less than £10 (£900 today) to his name, he set up a medical practice at 1 Bush Villas in Elm Grove, Southsea. The practice was initially not very successful. While waiting for patients, Doyle again began writing stories and composed his first novels, The Mystery of Cloomber, not published until 1888, and the unfinished Narrative of John Smith, which would go unpublished until 2011. He amassed a portfolio of short stories including "The Captain of the Pole-Star" and "J. Habakuk Jephson's Statement", both inspired by Doyle's time at sea, the latter of which popularized the mystery of the Mary Celeste and added fictional details such as the perfect condition of the ship (which had actually taken on water by the time it was discovered) and its boats remaining on board (the one boat was in fact missing) that have come to dominate popular accounts of the incident. Doyle struggled to find a publisher for his work. His first significant piece, A Study in Scarlet, was taken by Ward Lock Co. on 20 November 1886, giving Doyle £25 for all rights to the story. The piece appeared later that year in the Beeton's Christmas Annual and received good reviews in The Scotsman and the Glasgow Herald. The story featured the first appearance of Watson and Sherlock Holmes, partially modeled after his former university teacher Joseph Bell. Doyle wrote to him, "It is most certainly to you that I owe Sherlock Holmes ... Round the center of deduction and inference and observation which I have heard you inculcate I have tried to build up a man." Robert Louis Stevenson was able, even in faraway Samoa, to recognize the strong similarity between Joseph Bell and Sherlock Holmes: "My compliments on your very ingenious and very interesting adventures of Sherlock Holmes. ... Can this be my old friend Joe Bell?" Other authors sometimes suggest additional influences—for instance, the famous Edgar Allan Poe character C. Auguste Dupin. A sequel to A Study in Scarlet was commissioned and The Sign of the Four appeared in Lippincott's Magazine in February 1890, under agreement with the Ward Lock company. Doyle felt grievously exploited by Ward Lock as an author new to the publishing world and he left them. Short stories featuring Sherlock Holmes were published in the Strand Magazine. Doyle first began to write for the 'Strand' from his home at 2 Upper Wimpole Street, now marked by a memorial plaque. In this period, however, Holmes was not his sole subject and in 1893, he collaborated with J.M. Barrie on the libretto of Jane Annie. Doyle was found clutching his chest in the hall of Windlesham Manor, his house in Crowborough, East Sussex, on 7 July 1930. He died of a heart attack at the age of 71. His last words were directed toward his wife: "You are wonderful." At the time of his death, there was some controversy concerning his burial place, as he was avowedly not a Christian, considering himself a Spiritualist. He was first buried on 11 July 1930 in Windlesham rose garden. He was later reinterred together with his wife in Minstead churchyard in the New Forest, Hampshire. Carved wooden tablets to his memory and to the memory of his wife are held privately and are inaccessible to the public. That inscription reads, "Blade straight / Steel true / Arthur Conan Doyle / Born May 22nd 1859 / Passed On 7th July 1930." The epitaph on his gravestone in the churchyard reads, in part: "Steel true/Blade straight/Arthur Conan Doyle/Knight/Patriot, Physician, and man of letters". Undershaw, the home near Hindhead, Haslemere, south of London, that Doyle had built and lived in between October 1897 and September 1907, was a hotel and restaurant from 1924 until 2004. It was then bought by a developer and stood empty while conservationists and Doyle fans fought to preserve it. In 2012 the High Court ruled that the redevelopment permission be quashed because proper procedure had not been followed. A statue honours Doyle at Crowborough Cross in Crowborough, where he lived for 23 years. There is also a statue of Sherlock Holmes in Picardy Place, Edinburgh, close to the house where Doyle was born. My Review: Another good short story featuring Sherlock Holmes. In this particular one, a young clerk, Hall Pycroft, consults Holmes with his suspicions concerning a company that has offered him a very well-paid job. Holmes, Watson and Pycroft travel by train to Birmingham, where the job is initially to be based, and Pycroft explains that he was recently discharged by a stockbroking house. He eventually secured a new post with another stockbrokers, Mawson and Williams, in Lombard Street in the City. Before taking up the job, he was approached by Arthur Pinner, who offered him a managership with a newly established hardware distribution company, to be based in France. Pycroft is sent to Birmingham to meet Pinner's brother and company co-founder, Harry Pinner. He is offered a very well-paid post with one hundred pounds in advance, and is asked to sign a document accepting the post, and is also asked not to send a letter of resignation to his would-be employers (Who allegedly bet Pinner that he would reject Pinner's offer, Pinner betting in response that they wouldn't hear from Pycroft again). He immediately commences his duties, but he is concerned about the unprofessional aspects of the business and their sparse offices, as well as the suspicious fact that the two Pinners have a distinctive gold filling in their teeth in the same place, suggesting that they might be the same man. When the trio arrive at the Birmingham office, with Holmes and Watson presented as fellow job-seekers, Pinner is reading a London newspaper and is clearly in shock. As they leave, he attempts suicide, but Watson is able to revive him. Holmes concludes that the story of the brothers is a fabrication and that there is only one 'Pinner'; lacking enough men to make their attempt to deceive Pycroft convincing, Pinner had attempted to pose as his brother to make up the numbers in the hope that Pycroft would dismiss the similarities between them as a family resemblance. He further deduces that the whole point of the exercise was to obtain Pycroft's signature so that a 'fake' Pycroft may be employed at Mawsons (Hence why they asked him to not officially resign his post). Mawsons was keeping a vast stock of valuable securities, and 'Pycroft' was to be a safebreaker. Holmes goes to the office. From the newspaper, they learn that Mawson & Williams have suffered an attempted robbery, but that the criminal had been captured, although the weekend watchman has been murdered. Beddington, the forger and cracksman, was the miscreant, masquerading as Pycroft, and his brother was masquerading as Pinner. Nearly a hundred thousand pounds' worth of American railway bonds, with a large amount of scrip in mines and other companies, was taken, but recovered by the police from the would-be thief. As the police are called to arrest 'Pinner', Holmes observes that "Human nature is a strange mixture, Watson. You see that even a villain and murderer can inspire such affection that his brother turns to suicide when he learns that his neck is forfeited". I recommend this book to all readers who appreciate a well written mystery case. It contains similarities with other Doyle's short story, "The Red-Headed League", for it, too, involves an elaborate hoax designed to remove an inconvenient person from the scene for a while so that a crime can be committed. If you read this review, feel free to write a comment.